Gem, almandite garnet (natural), 2mm faceted round, A grade, Mohs hardness 7 to 7-1/2. Sold per pkg of 10. Item Number: H20-1947FG Have a question about this item? Almandite is the most widespread of the garnets with typical garnet characteristics. Its deep red appearance makes it a strong accent to jewelry designs. Sometimes it possesses interesting traces of brown or purple. All stones are eye clean. Gem, almandite garnet (natural), 4mm faceted round, A grade, Mohs hardness 7 to 7-1/2. Sold per pkg of 4. Gem, almandite garnet (natural), 3.5mm faceted round, A grade, Mohs hardness 7 to 7-1/2. Sold per pkg of 6. Gem, almandite garnet (natural), 2.5mm faceted round, A grade, Mohs hardness 7 to 7-1/2. Sold per pkg of 6. Gem, almandite garnet (natural), 7mm faceted round, A grade, Mohs hardness 7 to 7-1/2. Sold individually. 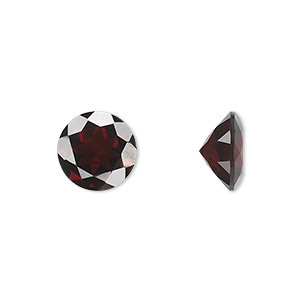 Gem, rhodolite garnet (natural), 2mm hand-cut faceted round, A grade, Mohs hardness 7 to 7-1/2. Sold per pkg of 8. Gem, almandite garnet (natural), 10mm faceted round, A grade, Mohs hardness 7 to 7-1/2. Sold individually. 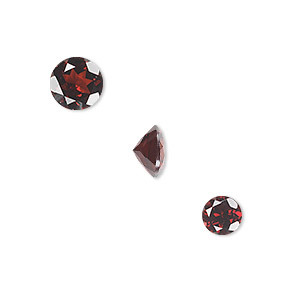 Gem, almandite garnet (natural), 3mm hand-cut faceted round, A grade, Mohs hardness 7 to 7-1/2. Sold per pkg of 8. 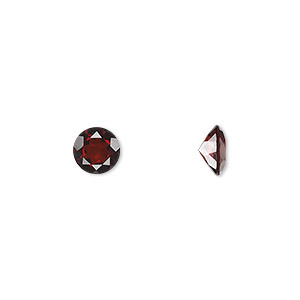 Gem, almandite garnet (natural), 6mm hand-cut faceted round, A grade, Mohs hardness 7 to 7-1/2. Sold individually. Gem, peridot (natural), 2mm faceted round, A grade, Mohs hardness 6-1/2 to 7. Sold per pkg of 10.